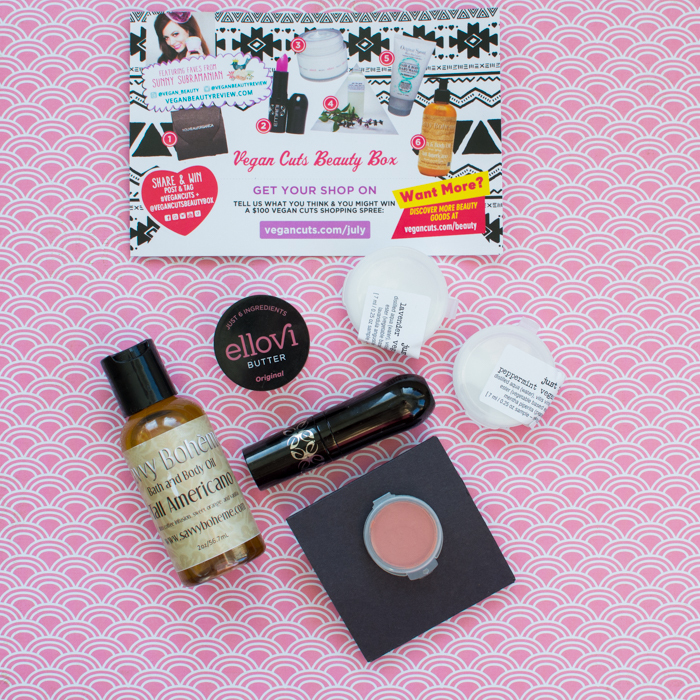 There are a lot of lovelies in July’s box curated by the lovely Vegan Beauty Review. Summer brings a coffee infused bath oil, multi-purpose lip/eye/cheek color, lipstick, body butters, and body lotion! Luxurious! Let’s get into it! 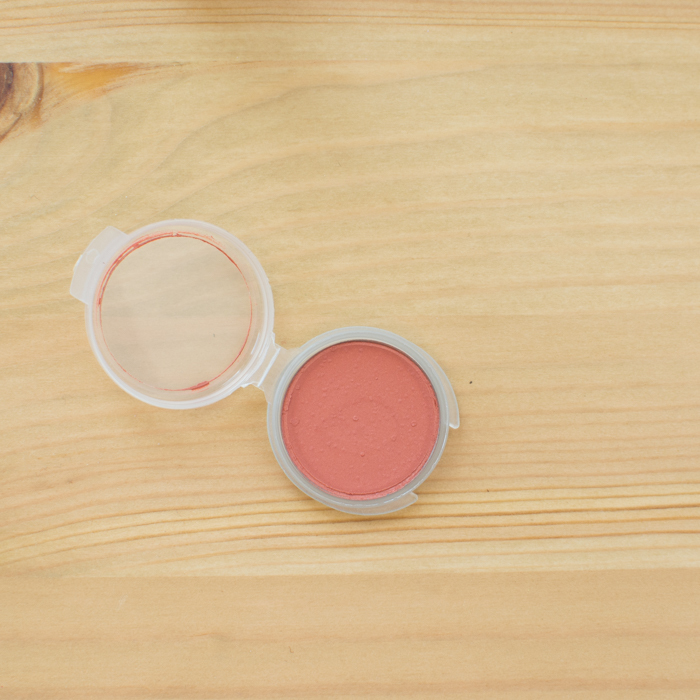 Description: Organic cream eye, cheek, and lip color in an exclusive peachy-pink shade. Compassion is a gorgeous coral peach rose color. It almost looks like a powder, but warms under the touch and blends effortlessly. On someone with very fair skin it could almost be used as a bronzer. It has faint shimmery flecks. I look forward to using this more. And how cool that it can be used on cheeks, lips, and eyes! I love products like that! Description: Hydrating and long-lasting lipstick in Temptress, a perfect shade for the summer babe look. 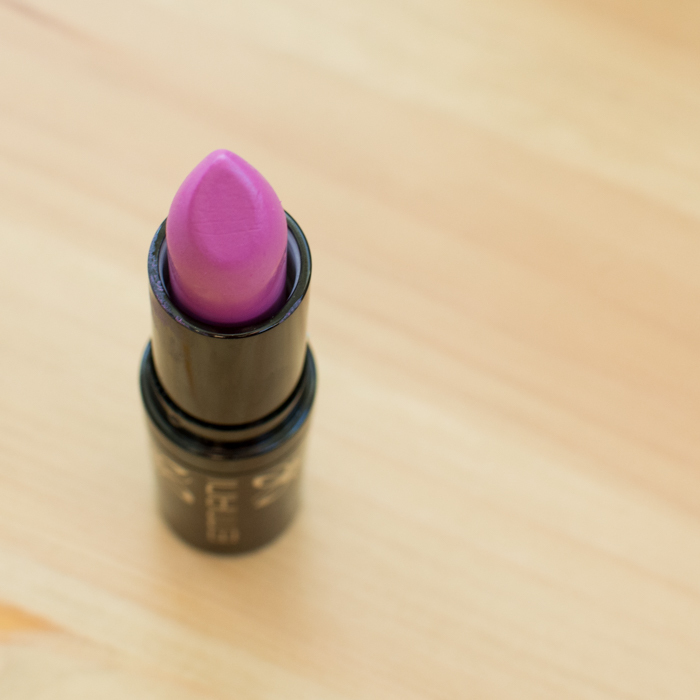 Temptress is a gorgeous lilac-pink. It’s showing up more saturated in the browser than it is in my original pic. If you can imagine a pink that’s almost purple, but looks more pink. Sad news, I was applying it and it broke off the base. Such a bummer. I can make it work, but still. 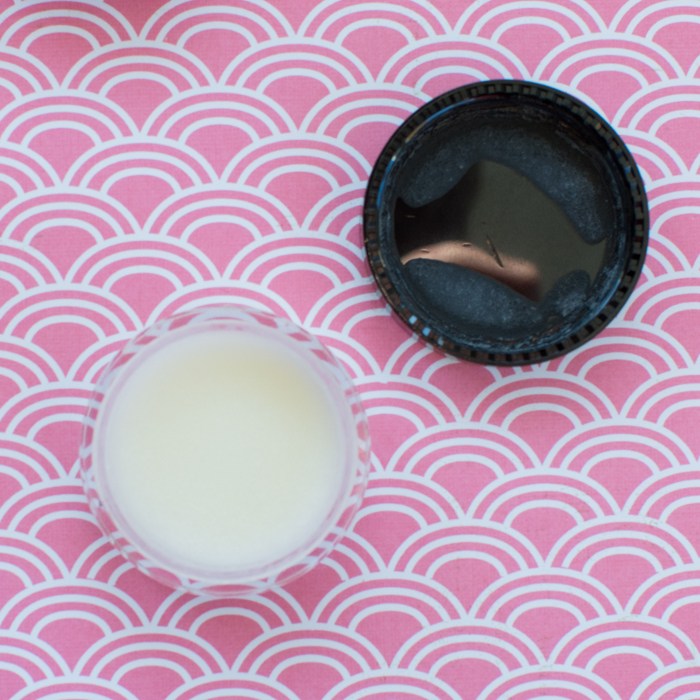 Description: Raw body butter made from just six natural ingredients. Keep cool to prevent melting. Ingredients: Macadamia Nut Oil, Coconut Oil, Hemp Oil, Shea Butter, Marula Oil, and Non-GMO Corn Starch. Just six ingredients. That’s pretty sweet! It’s very easy to apply and left my skin soft and moist without being oily. They also have Mint Chocolate, Vanilla, and Blossom scents. Description: Grapeseed oil-infused hand and body lotion that banishes dry summer skin. Oh. My. God. It looks like whipped cream! I loved putting this on right after a shower or even while at the computer typing away. It’s fluffy and not too greasy. Both scents smell delicious! Description: Moisturizing cleanser that’ll keep your skin and hair feeling as soft as that of a newborn babe. Loved!! I took this traveling and I didn’t get to try it on my hair, I did use it as a body wash. It was effective and gentle and strangely enough did remind me of Johnson&Johnson’s scent. Description: Moisturizing bath and body oil in an invigorating coffee scent. Ingredients: Grapeseed Oil, Extra Virgin Olive Oil, Sweet Almond Oil, Apricot Oil, Infusion of Coffee, Essential Oils of Sweet Orange and Vanilla, Vitamin E Oil. It smells like an espresso and has a perfect blend of oils. I will try this after a shower or bath and let you know if it gets me jacked like coffee or causes 💩 like coffee too. 😂 I think the infusion of coffee settled on the bottom of my bottle—no amount of shaking changed that. It still smells good though.